The Chicago Auto Show is the nation's largest and longest-running auto show. It's held annually in February at Chicago's McCormick Place convention complex. New 2020 Ford F-Series Super Duty Truck Line Illustrates how automakers use grilles to differentiate trim levels and their trucks from rivals. 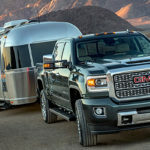 Heavy-duty trucks from Ford, Chevrolet and Ram as well as adventure SUVs from Toyota and Land Rover were the top vehicles at the 2019 Chicago Auto Show. The redesigned 2020 Land Rover Range Rover Evoque features new styling, a mild-hybrid option and advanced off-road technology. Nissan revealed a freshened appearance of it 2020 Rogue Sport subcompact crossover that will further distinguish it from its larger Rogue sibling. 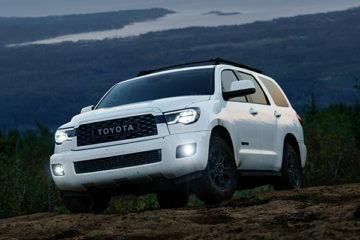 Two years after Toyota made its Sequoia full-size SUV off-road-ready, it has added a TRD Pro badge and Fox shocks for more rugged adventure. Building on its successful Ram pickups, Fiat Chrysler Automobiles’ truck division beefed up its medium-duty chassis cab to persuade buyers to drop a weight class. The 2020 Toyota RAV4 TRD Off-Road gains new suspension and all-terrain technology to add an adventurous side to the top-selling crossover in the U.S. The refreshed 2020 Toyota Tacoma, a favorite among off-roaders and adventurers, sports new styling and tuning to fend off Ford and Jeep. The refreshed 2020 Silverado HD sets a new bar for Chevrolet to challenge Ford and Ram for heavy-duty pickup truck sales. Ford will show its 2020 F-Series Super Duty truck with new gas and diesel engines and advanced safety technology at the 2019 Chicago Auto Show. Updates of several of the most popular trucks in the U.S. market, including the Ford Super Duty and Toyota Tacoma, will make public debuts at the Chicago Auto Show. The refreshed 2020 Toyota Tacoma will debut with a new look for the red-hot midsize pickup truck at the Chicago Auto Show in February.